Pizza is our favorite dish. We had been ordering it from pizza hut or Dominos sometimes, burning our pockets. 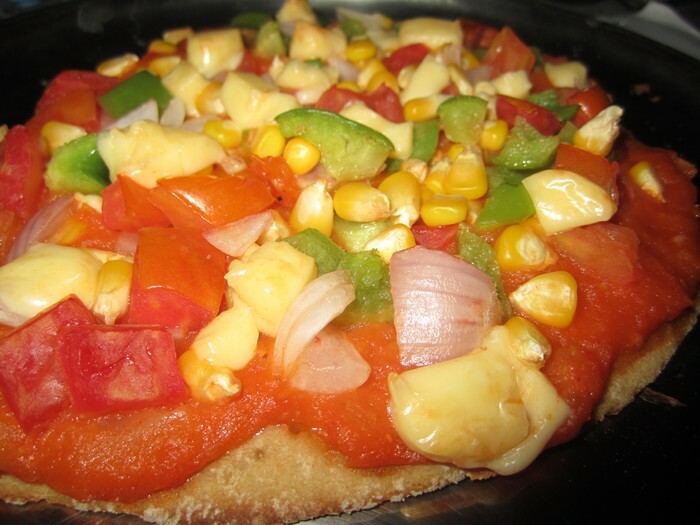 I will also use the “ready-made” pizza base that is available in super markets and bake the pizza with my favorite toppings and the most yummilious cheese. 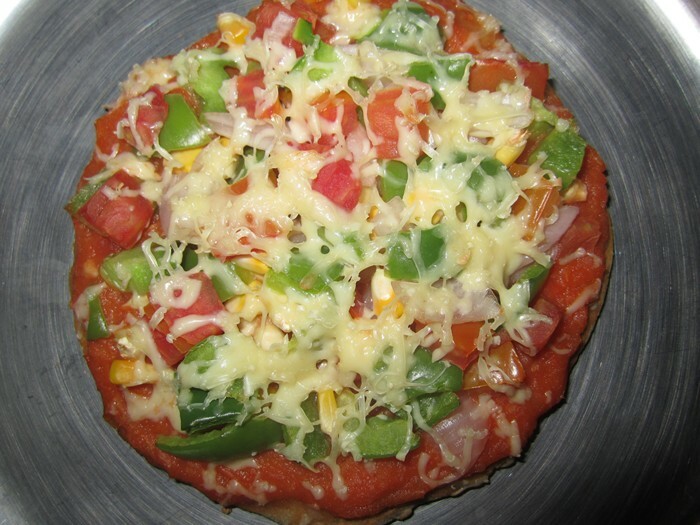 I had been wanting to try baking a pizza from the scratch and yesterday was the right time 🙂 These home made pizzas are more healthy as I used only whole wheat flour and there is a good serving of vegetable too. We loved it so much! Here is my recipe but once can modify the toppings or the sauce as required. Take a mixing bowl and put in wheat flour, salt, sugar and mix well. Add the active yeast to luke warm water and let it bubble (indication that the yeast is active). Pour in the yeast/water combination to the flour and knead well by adding additional water if required. Add the 2 tsp of oil and knead the dough to form a ball. Cover it with cling film and let it rest for an hour or so until it raises to double the amount. To prepare pizza sauce, take a pan – heat oil. Add the onion, tomatoes (diced) along with garlic. Let it simmer until the mixture is cooked well. Rest it to cool off and grind it into a coarse paste. Add salt, sugar and the chili powder (chili can be replaced with black pepper powder as well). Bring it to boil on the same pan until its thick and spreadable. Preheat the oven on 180&deg; for 10 mins on toast mode. Spread aluminum foil or apply oil on the baking try and place the pizza base. 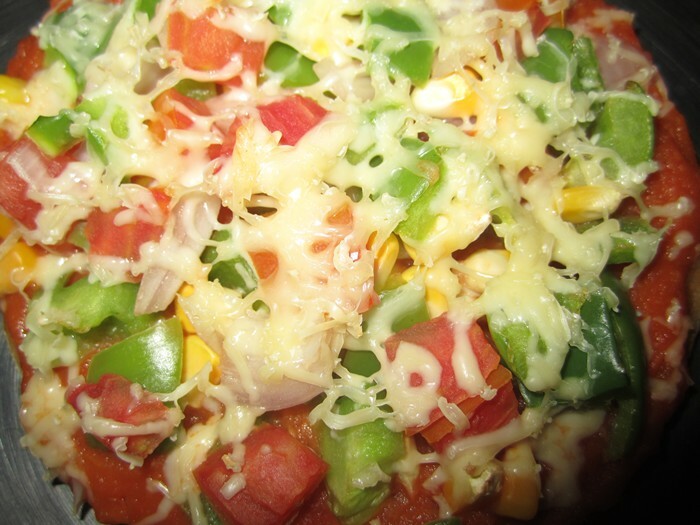 Spread the pizza sauce and top it with the vegetables along with the cheese. 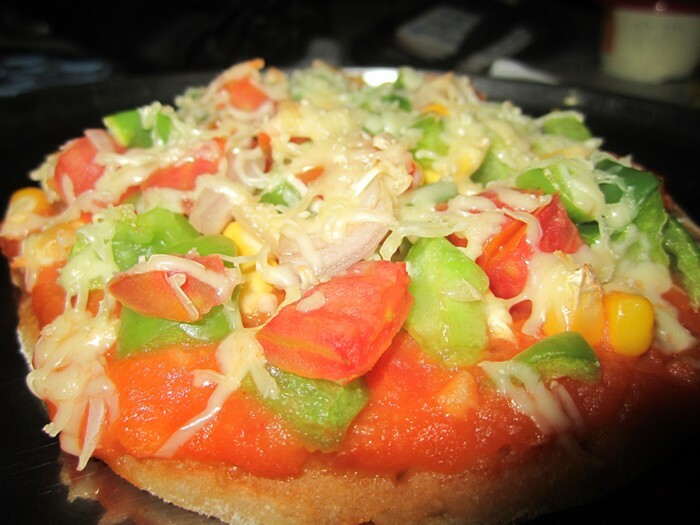 Bake the pizza on 180&deg; for 10 mins and toast it for about 5 mins. Serve it hot with oregano/chili flakes sprinkled.